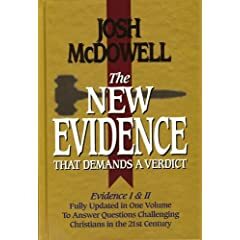 I’m teaching an apologetics class every Friday at the Baptist Missionary Associaton Bible College and yesterday I bought Josh McDowell’s The New Evidence That Demands a Verdict. Christianity is based on historical facts and is therefore open to verification. I recognize of course the all-important role of the Holy Spirit’s inner testimony: the Spirit creates faith in us and assures us of the things we believe in. Nevertheless, as people of faith who have been created by God with minds with which to think, our faith naturally seeks understanding. And one of the tasks which Christians have to undertake is that of examining and presenting the evidences for Christianity – to show that our faith is eminently reasonable and not blind at all. As Rom. 12: 1 says, our worship of God is a “reasonable worship or service”.